Ultra Marathon Running: Paleo Snacks - for the Ultra Runner who simply doesn't have the time. Paleo Snacks - for the Ultra Runner who simply doesn't have the time. I've not been unaffected by these, and when I started running longer distances realised that if I could lose a few kgs it would mean I could run further and for less effort. I don’t however follow any specific diet, but instead have cut back on fat and heavily processed foods, as well as including more salad and veggies in my meals. I think it’s just because I like too much of the naughty foods, and when you train a lot, you feel you've earned the right for a little treat. Recently I was given some samples of a new product, Paleo Hero from Function Well Foods, to try and this was something I was interested in. I had it in my head that the options would be bland, high in fibre and similar to eating a carpet tile! I was wrong. The concept behind the range is cater for those of us who have good intentions about diet but all too often are time poor. To follow any diet can be more time consuming in food preparation time, making sure you have all the right ingredients in the cupboard, and require mental discipline to stick to it which for some is not a feasible option or simply not convenient. 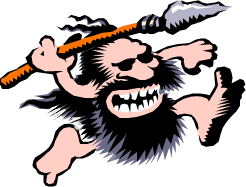 The Paleo Hero products provide an easy solution to this, offering tasty snacks which follow the Paleo diet regime. Paleo snacks in their natural environment! I tested two products, the Primal Mix and the Primal Slice, with different flavour combinations in both. The Primal Mix is a combination of beef jerky, nuts and organic berries. Once I opened this packet I couldn't leave it alone until it was finished, especially the spicy version. The combination of spicy beef jerky and cranberries is fantastic. The Primal Slice comes in three varieties, Peanut Butter Choc, Nut Crunch and Coconut Berry. Again these were really tasty, and surprisingly filling. They make a perfect snack between meals with a decent portion size, and if you were being particularly careful and disciplined you could use them as a meal replacement (if you weren't quite so hungry as me!). I did find the Nut Crunch to be a bit on the oily side, and when you look at the fat content it’s clear why. But this is a feature of the Paleo diet, plenty of protein and those “good” fats, coming from vegetable sources like coconut oil. I tried testing the slices as a mid run fuel, but to be honest these didn't work for me. They didn't sit well on my stomach which is probably a result of the higher fat and protein content, being less digestible under those conditions. However, both the jerky mix and the slices worked really well as a recovery food, either immediately after a run, or the next day. Often when my training volumes are high I feel quite flat and lacking in energy through the day. 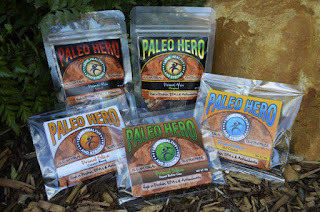 The Paleo Hero products, as a between meal snack topped up my energy levels, and clearly are providing all the right stuff to aid recovery and the repair of the muscles. I was pleasantly surprised by these products, and it’s great to know that they are the right thing to eat, and they taste great. All too often it’s easier to reach for the chocolate bar, or biscuits, and yet you know deep down that you shouldn't I’ll be keeping some Paleo Hero snacks in the cupboard for those moments of weakness!